haha good ones indeed. Must really be a bad salad. lol I'd rather have cake. 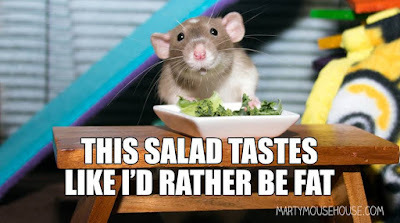 I agree with the rat! A rat in a hat. Adorable. I love the props she uses. Someone is very talented when it comes to rat photos. Her photos are always so fun. I'm glad you enjoyed the pictures. LOL! It is hard to eat healthy sometimes. ;) Happy Monday! lol It sure is. Have a great week. Have a lovely week Mary! So cute. And that salad mouse is 100% accurate! That's what I really liked about them. You can really see their personalities. These are so cute! I love the salad one. Oh that little baker is adorable! Oh my gosh, that first one cracked me up. Thanks for these! I know. I laughed too. Aw the baker ones are so cute!